With all of the new #1's coming out this month from DC Comics, it's easy to overlook a few other new comics from other publishers. 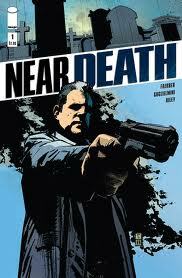 But thanks impart to a quick review from a comic shop on Bleeding Cool, last Wednesday at my local comic book store I picked up the new #1 issue of Near Death from Image Comics. I don't normally follow "crime books" but I like the hook. Plus I dig the artwork. So I'm on board. I contacted Simone and told him how much I enjoyed the book. I of course also told him about my campaign and Simone agreed to put my cameo in a future issue. Simone also told me he has quite a few issues completed already, and was finishing up issue #6. So I have a few months yet to wait for this, but now DMI also has something on the books already for 2012! Pick up Near Death #1!